The manufacture of sausages began over two thousand years ago, and it is still a growing industry. While some of its basic practices are almost as old as civilization, the industry is constantly adopting new developments in processing in the light of later scientific and technical knowledge. Sausage has been an important item in man's diet for twenty centuries. The first recognizable mention of this meat food is found in a Greek play called "The Oriya," or "The Sausage," written about 500 B.C. Thereafter the word for sausage occurs with frequency in Greek writings. It's also a favorite food of the Romans, at one time becoming so popular for festive occasions that it was placed under the ban of the early church. The modern word "sausage" is derived from the Latin ~salsus~, meaning salted. The term was probably originally applied to cured or salted meat generally. In the days of old people did not have refrigeration to preserve their meat and so making sausage was a way of overcoming this problem. Dry sausage was born as a result of the discovery of new spices, which helped to enhance, flavor and preserve the meat. Different countries and different cities within those countries started producing their own distinctive types of sausage, both fresh and dry. These different types of sausage were mostly influenced by the availability of ingredients as well as the climate. Some parts of the world with periods of cold climate, such as northern Europe were able to keep their fresh sausage without refrigeration, during the cold months. They also developed a process of smoking the sausage to help preserve the meat during the warmer months. The hotter climates in the south of Europe developed dry sausage, which did not need refrigeration at all. Basically people living in particular areas developed their own types of sausage and that sausage became associated with the area. For example Bologna originated in the town of Bologna in Northern Italy, Lyons sausage from Lyons in France and Berliner sausage from Berlin in Germany, in England they became associated with the county's, Berkshire, Wiltshire, Lincolnshire, Cumberland. Place olive oil in skillet over medium heat. Add, sausage, liquid smoke, Worcestershire sauce, salt and pepper, cook until slightly brown. Add potatoes, just before potatoes are fork tender, add onions. 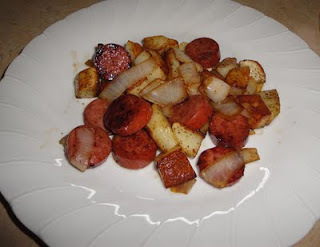 Cook until potatoes and onions are fork tender. Enjoy! I think i can do the same procedure but using a different type of sausage. I've always love sausages too. That is a delicious meal! Interesting read about sausage..thanks for sharing! Hi Elisabeth, that does sound good eggs over the top of the sausage & potatoes. Hi Christine. Just wanted to stop by and say thank you so much for your lovely comment on my blog. So nice to meet you! You have some great recipes on here. Love this one! Hi Country Cook, nice to meet you! Thanks for stopping by. Would love to have you come back and visit. Great little history lesson about sausages. I love pretty much ALL sorts of sausage, so this meal appeals to me a lot! I love this kind of meal, as well as my family!Thanks for sharing a bit about it, and have a great weekend! Your meal sounds wonderful and comforting! Hi everyone, thanks for the nice comments, love them all. That's a plate of comforts! Can't go wrong with the combination of potatoes and sausages. Hi Deepthidigvijay, thanks for stopping by. I will be happy to visit you.